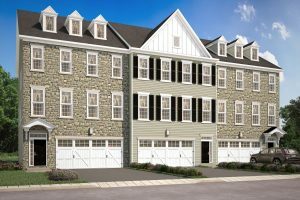 Posts Tagged "new homes Delaware"
Luxury townhomes are now selling at The Overlook at Rockford Falls, a homeowner’s dream community overlooking the Brandywine Creek. Recalling the atmosphere of a quaint European village, the newest master-planned community from the award-winning Montchanin Builders is only 1.5 miles from downtown Wilmington, DE. A peaceful enclave resting amidst preserved park land, walking trails and rock walls, The Overlook at Rockford Falls is part of historical Bancroft Mills. Interior Homesites – includes three bedrooms, 2.5 baths, a 2-car garage, with up to 4,000-square-feet living space, and a Turned Gable Roof with James Hardie® Exterior Siding Front & Back. Prices start at $509,900. 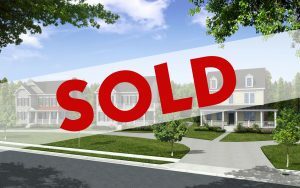 End of Group Homesites – includes three bedrooms, 2.5 baths, a 2-car garage, with up to 4,000-square-feet living space, a Stone front with Dormers and James Hardie® Exteriors on side and back. Prices start at $539,900. The Overlook at Rockford Falls is located within walking distance of Rockford Park and Bancroft Mills. This area had humble beginnings dating back to 1831, when English immigrant John Bancroft opened a textile mill. At the time, the mill was the largest of its kind in the country. By the 1930s, it was the largest mill in the world that was still standing. The Bancroft family had a love for the arts, and is credited with the opening of the Delaware Art Center in 1938. Within the center lies the Delaware Art Museum. Highlights include a 9-acre sculpture garden, various exhibits of modern American art, and weekly studio art classes. The Bancroft’s preservation efforts also include Alapocas Run State Park, located within Brandywine Valley. The parkland contains 26,000 square feet of playground for kids called the Can-Do Playground, which also includes an old quarry with a fully functional rock-climbing wall. Not far from Bancroft Mills lies Rockford Park, one of the oldest parks in Wilmington. It was donated to the city by the Bancroft family in 1889. The park contains a 100-year-old stone water tower as its main focal point, but also features numerous hiking paths, acres of woodlands, plentiful green spaces, tennis courts and an off-leash dog park — all available for residents of The Overlook at Rockford Falls to take advantage of. Joggers, bike riders, picnickers, and kite flyers couldn’t ask for a more serene setting. Preview The Overlook at Rockford Falls for yourself! Montchanin Builders invites you to preview their latest stunning creation: The Overlook at Rockford Falls. We are confident you will fall in love with your new home — especially when you get a glimpse of highly-sought amenities like hardwood floors, luxury bathrooms, gourmet kitchens, and dynamic personalization options. Call to schedule your preview appointment today!